Joon is a mentally ill young woman who lives with her brother, Benny. The movie follows Joon as she struggles with her disability and begins to fall in love with an eccentric young man named Sam. In the movie, Joon shows several signs of her disability. In car rides, Joon wears a helmet because of anxiety that plays out in her mind. She has a fascination with fire and begins fires several times during the movie. Joon also has trouble keeping nannies around because she gets very upset and begins to throw items at the nannies to try and get them out of the house. The struggle begins when Benny tries to decide whether or not Joon should be placed in a hospital to be monitored at all times. During one scene in the movie, Joon decides it would be a good idea to put on a scuba mask and stand in the middle of an intersection directing traffic. The cops end up taking care of the situation to find out that she has mental disabilities when they look at her hospital ID card. Towards the end of the movie, Joon runs away with Sam but forgets to take her medications, resulting in her freaking out on the city bus and having to be rushed to the hospital. 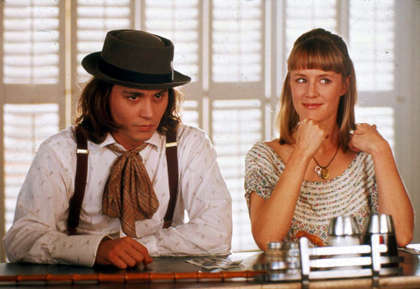 Below is a link to the Benny and Joon trailer where you can see bits of Joon's behavior as she struggles to take on different tasks including how to handle her feelings for Sam. According to the research that I found, Joon seems to be an accurate portrayal of an individual with mental retardation in most parts of the movie. She shows infantile behavior in several areas such as when she attempts to direct traffic while wearing a SCUBA mask. Also, towards the end of the movie, Joon has an episode of kicking and screaming on the bus. The episode gets so intense that the police had to take her to the hospital. Another moment is when she says she is scared of raisins. Her slowed learning skills were also apparent in the movie. Joon has to be watched at all times by someone, usually a nanny since Benny works all day. She is not sure how to do certain things such as cooking a meal. She is later taught by Sam how to make grilled cheese in his own eccentric way. At one point in the movie, Joon and Sam get intimate for the first time. Joon seems very child-like as if she was not sure what was going on. She seemed as though her mind was younger intellectually than it should be because of her confusion. There was one thing about Joon that I could not quite figure out how it was linked to mental retardation, or if it was at all. It was the fact that she loved fire and was basically a pyromaniac because of how often she set things on fire. Benny talked a lot about her love for it and how it intrigued her. I could not find this under my researched symptoms and behaviors of mental retardation. This may have been an entirely different behavior issue. Overall, I felt like Joon was portrayed rather accurately in this movie for a mild case of mental retardation.